What Power Sources Are Available for Electric Cars? Transportation contributed to over half of carbon monoxide and nitrogen oxides emitted into the environment in 2013, according to the Union of Concerned Scientists. It also contributed to a quarter of hydrocarbons emissions. Driving a traditional gas-fueled vehicle is a reliable way to travel with plenty of refueling stations, but it’s harmful to the environment. Electricity is a secondary energy source that is becoming increasingly more popular in vehicles. However, it can cause more pollution than gas and fossil fuels depending on its energy sources. Before investing in your next car, get a better understanding about your options and what is truly best for the environment. All light contains energy, but when it hits certain materials, it can be turned into an electrical current. To simplify the explanation, as the light gets absorbed by materials like silicon crystals, an electrical current is generated. Solar energy can power solar charging stations for electric vehicles. According to Revision Energy, just nine solar panels can power an electric car for roughly 12,000 miles of driving every year. In theory, charging an electric car has less of an impact on the environment than a gasoline-fueled car. But in reality, the power source behind the charging station matters. According to a study by the Proceedings of the National Academy of Sciences of the United States of America, if the electricity is generated from a coal-fired power plant, your clean-energy Chevrolet Volt may be polluting the environment as much as 80 percent more than driving a gasoline-powered vehicle. 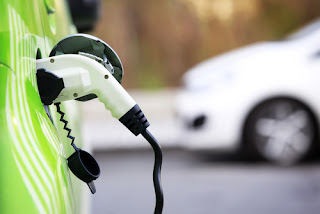 If you know your electricity comes from solar, wind, hydro, nuclear or other clean energy sources, an electric vehicle is better for the environment because it doesn't emit tailpipe pollutants. But if it's powered by coal, it might be best to stick to a gas variety until you can identify the best electric power source. Believe it or not, nuclear energy does not produce harmful polluting emissions. A nuclear-fueled power plant turns water into steam and drives a turbine generator to make clean electricity. Despite being an undervalued and underused energy source, nuclear energy is predicted to become a major source of power for electrical cars and hybrids. The government's Freedom Car and Fuel Partnership is working to develop affordable cars and trucks that reduce the country's dependence on oil and harmful emissions. Flowing water can be harnessed into electricity without emitting harmful emissions into the environment. The falling or flowing water helps churn a turbine that spins a generator that converts mechanical energy into electrical energy. This method is used for electric cars like the Nissan Leaf. One of the powerful benefits to hydropower is its reliability. While solar power requires a certain amount of sunlight and wind turbines require enough wind, hydropower is not intermittent because flowing water always flows. However, there are potential downsides, such as disturbing ecosystems. Your journey to a clean energy source for your electric vehicle doesn't have to be complicated. Use a site like Energy.gov to find over 17,000 alternative fuel stations in the United States. This site also can help you plan a route to see what types of stations can fuel your hybrid or electric car along the way.